Family Atlantica is ‘London’s musical melting pot at it’s very best’ according to reviews from The Guardian. The band, which consists of London-born multi-instrumentalist Jack Yglesias, Venezuelan vocalist Luzmira Zerpa, and half-Nigerian, half-Ghanian percussionist Kwame Crentsil, started out in an abandoned vicarage in Hackney, East London, before winning fans over with their eponymous debut album in 2013. The much awaited follow-up, Cosmic Unity, was finally released on the 13th May 2016 and was composed and produced with the help of two musical legends: The Sun Ra Arkestra’s bandleader Marshall Allen on alto saxophone, ewi and vocals, and Nigerian Orlando Julius on tenor sax. 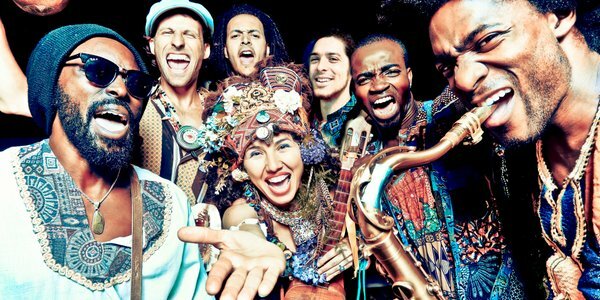 Cosmic Unity seems to be more centred around a West-African sound, rather than calypso and tropical beats, as was the case on Family Atlantica’s debut work, perhaps due to the involvement of these guests on the album. However, it is difficult to say which is their main influence, as the band’s music is as multicultural as its members. It is not African nor Caribbean nor Latin: it is all of them and so much more. Throughout these 15 tracks, the trio manages to move easily from jazz to afrobeat, from calypso to psychedelia and funk, and they are so well mixed together that the result is a cohesive and unique sound. ‘Okoroba’, the opening track, demonstrates this perfectly. The name may be African, but the sound originates from Venezuela and Colombia. This is followed by ‘Enjera’, an instrumental Ethiopian jazz piece of around 3 minutes. ‘La Humanidad’ showcases Latin music at its best, while ‘Baião Infinito’ brings Brazilian beats and an upbeat Caribbean mood to the table, similar to that of ‘Neti Neti’, a calypso track. There’s blues on display in ‘Blue Atlantic’ and a bit of everything is combined in the instrumental track that also gave its name to the whole album. The many flavours of this album are conveyed not only through the sounds, but also through the languages Zerpa sings in along with her native Spanish: there are songs in Portuguese (the aforementioned ‘Baião Infinito’), English and Yoruba (‘Efik’). Cosmic Unity is a cohesive unity of sounds, languages and identities, and it is indeed cosmic because it has the power to transcend cultural and geographical borders.